This is what the new MacBook Pro is supposed to look like. Well the major difference is the black colored sides on the display. 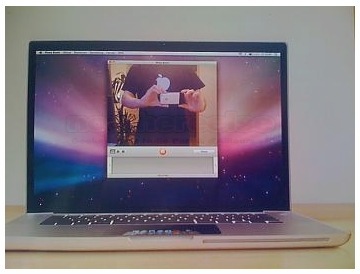 The photo of the person taking the photograph shows him/her wearing a black T-shirt with the Apple logo on it. It could be intended to mislead people believe that this was in fact the next device; maybe the person thought that the Apple logo on his/her T-shirt would lend more credibility to this photo. On the flip side, it could be original. Instead of giving it away, the T-shirt might have been intended as a message that this is authentic. We would not know till device is actually announced. Well more likely it seems to be an artist’s rendition. Whatever it is, it looks pretty cool and dandy. Little is known about this Brick. Some say that its a netbook, some say its just a new Mac Mini and there are others who say its just a tablet PC version of the MacBook. The tablet version has some meaning since Apple already possesses marvellous haptic technology to make the tablet experience more worthwhile. Let’s just wait and watch.